LOS ANGELES - The reserve sheriff's deputy who captured a suspect in dozens of Los Angeles arson fires works for $1 a year and was only on his third solo patrol. The Los Angeles County Sheriff's Department says Shervin Lalezary only qualified last month to work alone. He pulled over a van in Hollywood before dawn on Monday, hours after his official volunteer work shift had ended. 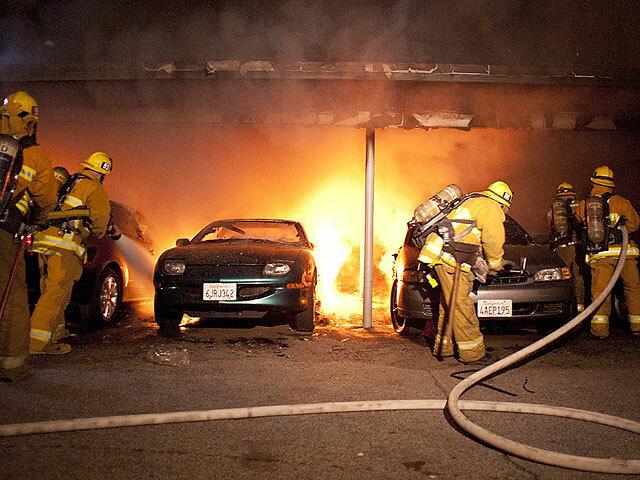 The driver, Harry Burkhart, was arrested for investigation of setting as series of fires that burned cars and damaged residences. Lalezary, a 30-year-old Beverly Hills real estate attorney, has been a reserve deputy since 2007. He won't say much about his achievement but city officials are calling him a hero. Burkhart's arrest appears to have halted the series of more than 50 vehicle and structure fires in more than a week. The blazes caused more than $3 million in damage and put Los Angeles residents on edge during the long holiday weekend. Police have said nothing about a possible motive in the fires set across Hollywood, neighboring West Hollywood and the San Fernando Valley. "We are very confident in this arrest, but we have a long way to go," said Police Chief Charlie Beck. Burkhart, a German national, was identified by U.S. State Department officials who recognized him from surveillance video because of an immigration dispute involving his mother. He was being held without bail. Authorities didn't know how long he's been in the United States and said he isn't cooperating with them. Sheriff Lee Baca called him the "most dangerous arsonist in Los Angeles County that I can recall." The intentionally set fires kept residents anxious over the holiday weekend in some of the most densely populated areas of the city. Hundreds of investigators, police officers and firefighters raced to deal with the blazes. The fires forced many apartment dwellers from their homes. But there were no serious injuries  one firefighter was hurt in a fall from a ladder, and another person suffered smoke inhalation.